With the show I'm putting on tonight in Oxford, I'll have been to 6 gigs in 9 days (somehow fitting lectures into that!) I was lucky enough to win tickets for a Leo Stannard headline show put on by the wonderful guys at Mahogany last night. As can be expected by the calibre of their session videos on Youtube, it was a cleverly chosen line up and a really beautiful night of acoustic music. Second up was George Taylor, whose music I hadn't heard before, but I found that it fit in quite well with the rest of the evening. Mahogany are, in a similar way to something like Communion, folk who you know you're in safe hands with when listening to artists they like. Don't get me wrong, I enjoyed George's set but it did get a little repetitive after a while (which doesn't necessarily have to be a bad thing), I get the impression that he's used to performing more with a full band than solo. 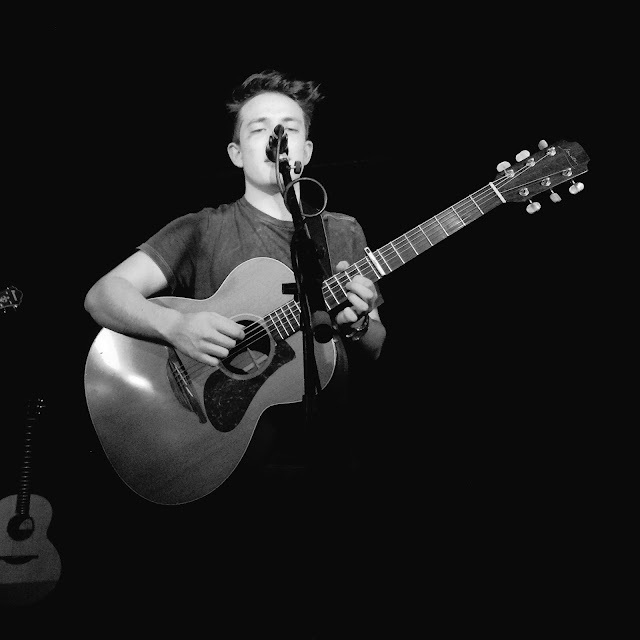 Last up for the night was headliner Leo Stannard, who at just 20 has been backed by Mahogany for a few years now. He first started to get noticed at 16, at which point I saw a video of him performing and commented saying I liked it, to which 16 year old Leo responded by adding me as a friend; so I've vaguely followed his career for a few years but until last night hadn't paid too much attention - more fool me! Having recently released his Free Rein EP, Leo played the tracks from this interspersed with a few others, bringing on friends to join him for a few tracks on cello, electric guitar and drums. With his unique percussive style, which you can see in his latest video for Lost (which is on the Free Rein EP) below, Leo brought something fresh to the performance, and I couldn't shake off the feeling that I was witnessing a star in the making (I think the rest of the packed out crowd at London's Courtyard Theatre would agree), the next in line with the likes of Ben Howard, George Ezra, James Bay and Hozier. The prospect of having to get up at 7am to get to a lecture this morning suddenly seemed worth it, Leo's set was great, and I'll definitely be following his career a little more closely from now and hope he gets as far as he deserves!